This would seem to be an open-and-shut case. Artists came to an exhibition, saw their own historical works which they had been told were lost, and asked for them back. Afrika graciously conceded, simply stipulating that the artists buy them back. It was a bold, blatant maneuver and should have been a no-brainer. But in the courtroom, things took a turn when the defendants, artists Kozlov, Oleg Maslov, Inal Savchenko and Oleg Zaika – “tiny little jackals who want to attack the bigger, stronger animal” as Afrika publicly denounced them – were unable to provide the proof of ownership required for the court. After all, the signatures and signature styles were not enough to establish that the artists had not given the works to Afrika, but in the age of squats, who has time to draw up certificates of authenticity for something finger-painted on the back of a doorframe? This entry was posted in St Petersburg and tagged Andrey Khlobystin, contemporary art in Russia, contemporary art in St Petersburg, Evgeny Kozlov, Georgy Guryanov, Inal Savchenko, Oleg Kotelnikov, Oleg Maslov, Oleg Zaika, Sergey Bugaev Afrika, St Petersburg art, The New Artists, Underground art. Bookmark the permalink. The question of authenticity is not a problem of the past only. 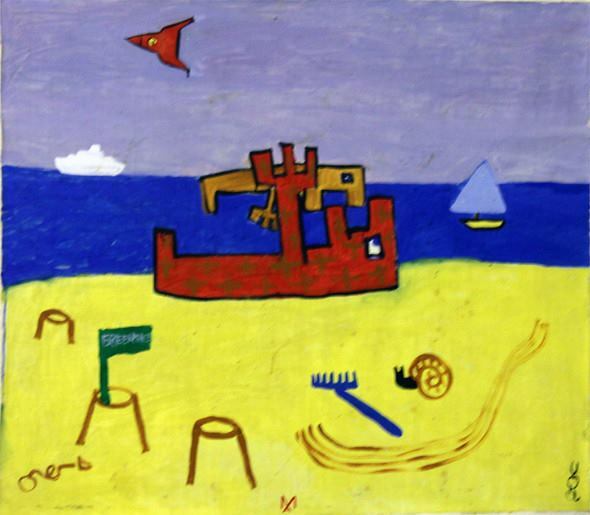 The picture of the painting above – “Beach” by Victor Tsoi, Oleg Kotelnikov and Andrey Medvedev from the 1980s – was taken in 2011 at the Moscow gallery “Panoptikum Inutero”. In 2013 the work has appeared with a new co-author: Sergei Bugaev (Afrika). At the exhibition “ASSA” it was shown with his signature “AFRika” in bright red letters at the bottom of the canvas, and the little green flag was painted dark with equally bright red letters on top reading “ASSA”. Evgenij Kozlov, Oleg Maslov, Inal Savchenko and Oleg Zaika hope to get their paintings returned without additional signatures.